The Geneva Motor Show will see the comeback of an intriguing product idea when Mercedes-Benz presents the Coupé range in the new E‑Class. Just three months after the presentation of the Saloon, the brand is therefore launching a new highlight in the new model series while continuing a tradition that has repeatedly met with great enthusiasm throughout the history of the E-Class. The new E-Class Coupé offers a very special combination of two attributes for which the Mercedes brand is known: fascination and efficiency. With its classic coupé side aspect – no B-pillars and fully retractable side windows – the new two-door car is a particularly sporty interpretation of the E-Class's dynamic design. At the same time the most aerodynamic variant of the Coupés achieves a new world best in terms of drag coefficient: with a Cd-figure of just 0.24, this model is the world's most aerodynamically efficient series-production car. The model programme includes two new 4-cylinder engines, which consume up to 17% less fuel whilst offering a significant increase in performance and torque. The new E-Class Coupé's standard-fit AGILITY CONTROL suspension adjusts automatically to the current driving situation. It combines driving enjoyment and excellent handling with the maximum comfort. 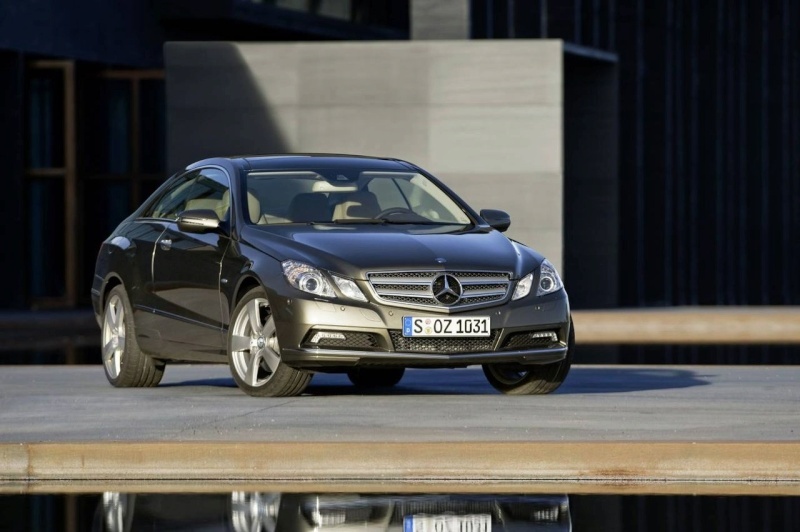 The new E-Class Coupé will be in the showrooms of the European Mercedes-Benz dealerships and company-owned sales outlets at the beginning of May 2009. The new Coupé offers all the technical innovations of the new E-Class series that one might expect to find in a sports-oriented luxury coupé. These include selective damper control, drowsiness detection, preventive occupant protection and the Active Bonnet. As a feature specific to the Coupé, the Dynamic Driving package allows different suspension setups at the touch of a button. Adaptive Main Beam Assist, road sign recognition and an automatic emergency braking system are other features with which the new series sets standards in this vehicle category. The E-Class also takes on a pioneering role in the drive sector. The new diesels and direct-injection petrol engines combine efficiency with an effortless power delivery. The engine line-up includes two new four-cylinder models which deliver significantly more power and torque while consuming up to 17 percent less fuel. The best example is the E 250 CDI BlueEFFICIENCY Coupé, which consumes 5.3 litres of diesel per 100 kilometres and emits 139 grams of CO2 per kilometre, making it one of the most economical vehicles in its class. The exemplary, low fuel consumption has not only been achieved because of the new engines, but also with a number of practical measures. These include on-demand activation of the steering and fuel pumps, the use of tyres with low rolling resistance and an alternator control system which takes account of the current driving situation and the vehicle's electrical power requirements, plus the very decisive factor of outstanding aerodynamics . The design of the new two-door model includes traditional styling elements which give Mercedes-Benz Coupés their unmistakable identity: for example the side windows, which are not interrupted by a B-pillar and are fully retractable. Another hallmark of Mercedes Coupé design is the sports radiator grille with the large central star. At the same time, however, the new model points the way to the future with an exciting, contemporary design idiom. Saloon. This is shown by the 'twin-headlamp face', with rhomboid contours but somewhat sportier, sharper treatment for a more dynamic and incisive look. Another design feature which the Coupé shares with the Saloon is the powerful contour of the rear wing - a styling cue which also gave the S 220 "Ponton" Coupé of 1955 its athletic appearance. Although it shares family traits with the Saloon, the Coupé has its own, distinct identity characterised by effortless superiority and a greater sense of passion. The arrow shape of the entire front section from front bumper to radiator to bonnet, the more extreme interpretation of the twin headlamp face and its more sinewy build give it a racier and more dynamic presence. The seats of the E-Class Coupé are new developments whose design and techno-logy reflect the sporty nature of this two-door Mercedes. They are electrically adjustable for seat height and backrest angle as standard. The high, sports car-like seat backrests have a practical Easy-Entry function to make access and egress easier for rear-seat passengers. In conjunction with electric seat adjustment with memory (an optional extra), the front seats are equipped with electropneumatically adjustable four-way lumbar supports; these are able to provide anatomically favourable support for the lower spine, which further improves seating comfort. Luxury seats with leather upholstery and active ventilation are available as optional extras, as are newly developed multicontour seats with inflatable air chambers in the front seat cushions as well as in the centre and side bolsters of the backrests. Two comfortable individual seats are available for the rear passengers. These feature backrests which can be folded down individually or together to increase the capacity of the luggage compartment. The diesel in the E 250 CDI BlueEFFICIENCY Coupé is the top-of-the-range unit in the new generation of Mercedes-Benz four-cylinder engines, which are notable for features such as two-stage turbocharging, precise piezo injectors and the latest common-rail technology. The engine has an output of 150 kW/204 hp and develops a maximum torque of 500 newtonmetres which is available from just 1600 rpm. This means that it is some 36 percent more powerful than the four-cylinder diesel in the preceding model yet consumes 17 percent less fuel: 5.3 litres per 100 kilometres (combined NEDC consumption, provisional figure). This corresponds to a carbon dioxide emission level of 138 grams per kilometre. The turbocharged V6 diesel engine with common-rail direct injection remains in the line-up. Fitted in the E 350 CDI BlueEFFICIENCY Coupé, it develops 170 kW/231 hp (previously: 165 kW/224 hp) and consumes 6.8 litres per 100 kilometres (combined) in the NEDC cycle. Its carbon-dioxide emissions are 179 grams per kilometre. Mercedes-Benz has also chosen to move over to direct-injection technology for its petrol engines. Once again, the E-Class Coupé points the way: the powerplant at work under the bonnet of the E 250 CGI BlueEFFICIENCY Coupé is a newly developed four-cylinder direct-injection unit with 150 kW/204 hp and a five-speed automatic transmission as standard. This engine makes do with 7.0 litres of fuel per 100 kilometres (combined NEDC consumption, provisional figure). CO2 emissions are 164 grams per kilometre. This is some 13 percent less than the figure for the previous four-cylinder engine (135 kW/184 hp) with conventional fuel injection. Mercedes-Benz has replaced the previous V6 petrol engine with the world's first six-cylinder unit featuring spray-guided direct petrol injection in the new E 350 CGI BlueEFFICIENCY Coupé. This engine develops 215 kW/292 hp – an extra 15 kW/20 hp – and consumes about 14 percent less fuel than the previous V6 engine: its combined NEDC consumption per 100 kilometres is just 8.5 litres. This corresponds to 199 grams of CO2 per kilometre. In the top-of-the-range model, the E 500 Coupé, the muscular V8 engine with 285 kW/388 hp and 530 newtonmetres of torque offers the performance characteristics of a sports car. Mercedes engineers have enhanced details of the eight-cylinder unit, reducing the fuel consumption (compared to the preceding model) by 0.5 litres to 10.9 litres per 100 kilometres (combined NEDC consumption). All the engines in the new E-Class Coupés meet the EU5 exhaust emission standard. The safety systems newly developed for the E-Class are based on accident research findings; they can make a valuable contribution to enabling safe, accident-free driving, improving vehicle occupant protection and, moreover, helping to increase the safety of other road users. These trend-setting developments are also available for the new E-Class Coupé, or are included in its standard equipment. Based on highly sensitive sensors, cameras and radar systems, they turn this two-door model into an "intelligent partner" able to see, feel and react reflexively in critical situations and, if necessary, act independently if the danger of an accident is acute. Drowsinessis one of the most common causes of accidents on motorways. This is why Mercedes experts have developed the ATTENTION ASSIST system which forms part of the standard equipment of the new E-Class Coupé. As the vehicle is being driven, the system continuously evaluates more than 70 different parameters in order to identify driver drowsiness and provide a warning before the dangerous microsleep phase begins. Observing the driver’s steering behaviour has proved to be a particularly strong indicator: several years of practical research by Mercedes engineers have shown that drowsy drivers make minor steering errors which they often correct very rapidly in a characteristic way. This steering behaviour is recognised by a special steering angle sensor. Also fitted as standard is the PRE-SAFE® anticipatory occupant protection system - a Mercedes invention which has received a number of awards and which is not offered by any other vehicle in this class. If there is an immediate danger of an accident occurring, the system activates protective measures for the driver and front passenger as a precaution so that the seat belts and airbags can provide their full protective effect on impact. This warning of an impending accident is possible because PRE-SAFE® uses the sensors of the Brake Assist system and the Electronic Stability Program (ESP®) to identify potentially critical dynamic handling situations. Like the Saloon, the new E-Class Coupé also offers the latest lighting technology. The headlamps adjust continuously to the current driving situation and react automatically to offer the driver the best possible degree of road illumination at all times. This task is taken care of by the Adaptive Main Beam Assist function: a camera fitted on the inside of the windscreen allows the system to detect oncoming vehicles/vehicles in front and automatically controls the headlamps to prevent the other road users from being dazzled. As a result, the range of the dipped-beam headlamps can increase from the current norm of 65 metres to as much as 300 metres. If the road ahead is clear, the system performs a gradual transition to high-beam mode. Adaptive Main Beam Assist is based on the bi-xenon headlamps, which Mercedes-Benz offers in combination with LED daytime driving lights. The well-proven assistance systems from the S-Class which help to prevent rear-end collisions are now available for the E-Class Coupé, too. They use long and short-range radar sensors to monitor the traffic situation ahead of the vehicle and warn the driver if there is a risk of an accident. Mercedes-Benz combines these technologies in the DISTRONIC PLUSsystem; along with the proximity control system - which automatically maintains the Coupé at a set distance from the vehicle in front and can brake it to a standstill if required by the traffic situation - this comprises Brake Assist PLUS and the PRE-SAFE® Brake. Brake Assist PLUS intervenes if there is suddenly a very rapid reduction in the distance. In this situation, the system warns the driver and almost instantaneously calculates the degree of braking assistance necessary to prevent a collision. This brake force is available immediately the driver depresses the brake pedal. Depending on the speed and distance, it allows controlled braking to a defined point or - if necessary - emergency braking. The PRE-SAFE® Brake goes a step further and automatically brakes the E-Class if there is imminent danger of a collision and the driver does not react to the warnings. This can reduce the severity of an impact considerably, as the system can be regarded as something like an "electronic crumple zone" which offers the occupants an even greater degree of safety. With seven standard-fit airbags, belt tensioners and belt force limiters on all seats, as well as crash-responsive head restraints for the driver and front passenger, the new E-Class Coupé offers the most comprehensive array of safety features in this vehicle category. The range of airbags, which can deploy in thousandths of a second in an accident, comprises front and side airbags for the driver and front passenger, a kneebag for the driver and windowbags. Rear sidebags are available as an optional extra. The front crumple zone has four independent impact planes which allow the forces to be distributed over a wide area while bypassing the passenger cell. Furthermore, increased use of extra-high-strength steel alloys helps the vehicle body to withstand high impact loads. In fact, particularly strong grades of steel like this account for about two thirds of all the sheet metal used in the bodyshell of the E-Class Coupé. An Active Bonnet, which forms part of the standard equipment, is the latest development to result from Mercedes-Benz's long-standing and successful commitment to pedestrian protection. In the event of an impact, a system of springs raises the rear section of the bonnet by 50 millimetres within a fraction of a second, thereby increasing the available deformation space. A special feature of the Mercedes system is its reversible mechanism which allows the driver to reset the Active Bonnet without having to visit a workshop. Along with safety, comfort has always been one of the outstanding qualities of the E-Class. Here, too, the Coupé lives up to the high standard set by the Saloon and demonstrates further noticeable progress, especially with regard to ride, seating and climate comfort. Another important comfort factor is the generous interior space, which Mercedes engineers created by increasing both the length and width of the vehicle body by 46 millimetres. This resulted in the distance between the front and rear seat reference points - an important dimension for the occupants' freedom of movement - increasing by ten millimetres to 789 mm while the elbow width improved by up to 49 millimetres, compared to the preceding model. The new E-Class Coupé's standard-fit AGILITY CONTROL suspension adjusts automatically to the current driving situation. In order to provide the best possible ride comfort, this system reduces the damping during normal driving but immediately applies the maximum damping force during dynamic cornering or sudden evasive manoeuvres. This ensures optimum stabilisation of the Coupé. As an alternative to the standard-fit AGILITY CONTROL suspension which is set up for comfort, a variant with a sportier damper response and more direct steering – the AGILITY CONTROL sports suspension – is available as an optional extra. To meet the requirements of even more demanding drivers, Mercedes-Benz has developed a dynamic handling package with an electronically controlled damping system. This processes sensor data about the current driving situation and adjusts the shock absorbers separately for each wheel. Furthermore, the driver can switch between two drive modes - Comfort and Sport - which make corresponding adjustments to the suspension set-up, accelerator response and the shift points of the automatic transmission. A newly developed speed-sensitive sports steering system with a more direct ratio and variable centring is also included in the dynamic handling package. In order to allow a comparison of suspension characteristics, Mercedes engineers have developed the body index - a composite formula which is calculated from the readings for various typical driving manoeuvres. The body index is an indi-cation of how well the suspension is linked to the body, how closely the car hugs the road and how nimble the handling is through fast bends. The higher the figure, the sportier - i.e. the firmer - the suspension characteristics. The body index shows how the dynamic handling package is able to meet customers' requirements for dynamism and comfort in equal measure: the index figure of 2.06 attained in Sport mode is reduced to 1.89 - a typical level for a saloon - when Comfort mode is selected. The newly developed luxury automatic climate control system regulates the temperature, volume and distribution of the air in three zones to meet the requirements of the driver, front passenger and rear passengers. What's more, for the first time, this optional THERMOTRONIC system allows the selection of different climatisation modes: the occupants can choose "Diffuse", "Medium" or "Focus" modes at the touch of a button in order to adapt the air volume and distribution to their personal preferences while still benefiting from the convenience and comfort of automatically regulated climate control. Fitted as standard in the E-Class Coupé, the THERMATIC two-zone automatic climate control has been enhanced to offer five percent more heating and cooling power than the version fitted in the predecessor model. The well-proven operating concept from the S-Class, comprising the multifunction steering wheel, Controller on the centre tunnel, colour display in the dash-board and direct selection buttons also offers the occupants of the new E-Class Coupé a very high standard of operating comfort. The Controller puts all the functions of the advanced infotainment system - such as the radio, CD/DVDplayer, telephone and navigation system - at the fingertips of the driver and front passenger. The Audio 20 CD radio with eight loudspeakers, a CD player and a Bluetooth interface for a mobile phone is fitted as standard. Customers who specify the optional COMAND APS multimedia system benefit from additional functions: a Europe-wide hard-disc navigation system, a DVDchanger, the Music Register (storage for about 1000 music tracks) and voice control with whole-word recognition. Further options for even greater listening pleasure are available in the form of a 500-watt surround sound system, a media interface for connecting external MP3 players and a tuner for digital radio reception. With an initial line-up of five engines, three suspension variants, a wide choice of colours, six different wheel/tyre combinations and many optional extras, the new E-Class Coupé offers plenty of scope for customers to turn their individual automotive dreams into reality. The basis for configuring the look and feel of the Coupé is provided by the ELEGANCE and AVANTGARDE interior concepts. These not only offer different upholsteries and items of trim, but are complete configuration packages designed to create a harmonious atmosphere. Depending on the choice, the interior differs in its colour scheme and mix of materials to emphasise the elegant or progressive character of the Coupé. The AMG Sports package, on the other hand, clearly focusses on agility and performance potential. AMG bodystyling includes the unmistakable contours of the AMG front apron with large air intakes, AMG side skirts and the expressive AMG rear apron with a black insert. High-sheen 18-inch AMG light-alloy wheels in a 6 twin-spoke design with wide-base tyres in size 235/40 R 18 at the front and 255/35 R 18 at the rear provide further highlights. The AGILITY CONTROL sports suspension with a stiffer spring, shock absorber and stabiliser setup is combined with large, perforated brake discs at the front, plus brake callipers with Mercedes-Benz lettering. Perfect road contact is ensured by the sports speed-sensitive steering with a more direct ratio. Striking interior features include upholstery in black ARTICO man-made leather. Leather or the particularly exclusive nappa leather is also available in a wide range of colours. Multicontour seats for the driver and front passenger provide the best possible adjustment to personal comfort preferences, thereby ensuring outstanding long-distance comfort. With production limited to the first few months, the E-Class Coupé is also available as a Prime Edition series which particularly emphasises the new model's character with selected, high-grade features. Among the most eye-catching are the palladium silver metallic paint finish, a panoramic glass sliding roof and 18-inch AMG high-sheen light-alloy wheels painted in titanium grey. Inside, a designo-interior with two-tone designo leather upholstery, matching designo floor mats and a sports pedal cluster of brushed stainless steel rounds off the exclusive overall impression.